Claim victory in the war against worry this year! With your generous gift of any amount, receive Pastor Bobby’s new series, Winning the Worry War on 4 CDs plus the Overcome Worry 5-card set. Learn how to truly win the war against worry this year with Pastor Bobby’s new series, Winning the Worry War. Also, with your generous gift of any amount, we’ll send you 5 Overcome Worry cards to help you win the war against worry in key areas of your life. 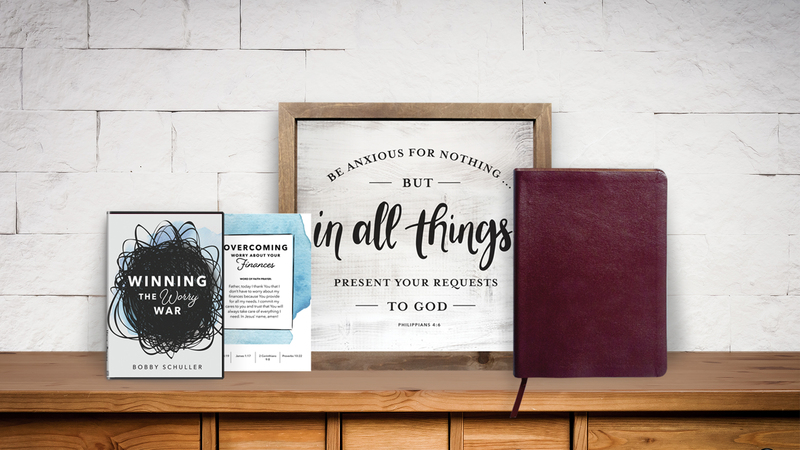 With your gift of $100 or more, receive the Anxious for Nothing 12“x12” framed wall art, Winning the Worry War 4-CD series, plus the Overcome Worry 5-card set. Enjoy this beautiful, custom, hand-lettered, framed art in your home as a beautiful reminder to cast all your cares on the Lord and choose gratitude. 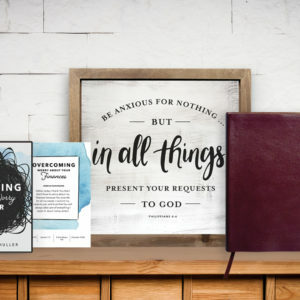 With your gift of $250 or more, receive the NIV Thinline, Large-Print Bible, framed art, new 4-CD series, and 5-card set. This beautiful, burgundy, bonded leather reference Bible is perfect for studying the Word of God wherever you go, helping you claim victory in the war against worry as you study.